Playing to sold-out houses December 15 to 16 at the Diana Wortham Theatre, BCA's production of the holiday classic The Nutcracker was a huge hit. Featuring Julia Fleming and Elianah Vargas as Clara, Blair Chamberlain & Joel Paulus as the Sugar Plum Fairy & her Cavalier, Sarah London as the Dew Drop Fairy, Chris Lynn as Drosselmeyer and talented dancers from our Pre-Professional division, this year's shows continued to make everyone smile. In addition, this year's production included a new and spectacular growing Christmas Tree plus lots of new choreography, including Jewel Angels, Snow and Arabian. 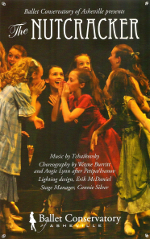 Download the Nutcracker 2011 program. The curtain opens to reveal the Stahlbaums' house, where a Christmas Eve party is under way. Clara, her little brother Fritz, and their mother and father are celebrating with friends and family, when Clara's mysterious godfather, Herr Drosselmeyer enters. He quickly produces a large bag of gifts for all the children. All are very happy, except for Clara, who has yet to be presented a gift. Herr Drosselmeyer gathers everyone around and tells the story of the Nutcracker and the Mouse King. The children are fascinated. Herr Drosselmeyer then produces life-size dolls, which each take a turn to dance. When the dances are done, Clara approaches Herr Drosselmeyer asking for her gift. It would seem that he is out of presents, and Clara, while still quite happy, gently hints to Drosselmeyer that she would like a toy. Drosselmeyer then produces a Nutcracker, in the traditional shape of a soldier in full parade uniform. Clara is overjoyed, but her brother Fritz is jealous, and breaks the Nutcracker. The party ends, the guests leave, and the Stahlbaum family goes to bed. After everyone is asleep, Clara creeps downstairs to have a look at her beloved Nutcracker. When the clock strikes midnight, she hears the sound of mice. She wakes up and tries to run away, but the mice stop her. A conflict ensues and Clara helps the Nutcracker win the battle with the Mouse King. The mice retreat, taking their dead leader with them. The Nutcracker is then transformed into a prince. Clara and the Prince travel to a world where dancing Snowflakes greet them, welcoming Clara and the Prince into their world. The curtain falls on Act I.
Clara and the Prince arrive at the Kingdom of Sweets, ruled by the Sugar Plum Fairy. The Fairy and the people of the Kingdom of Sweets perform several dances for Clara and the Prince: a Spanish Dance, an Arabian Dance, a Chinese Dance, a Russian Dance, a Marzipan Dance, Mother Ginger's Dance, the Waltz of the Flowers, and the Grand Pas de Deux. After the Grand Pas de Deux, everyone dances a joyous Final Waltz. The ballet ends with Clara waking up with the Nutcracker toy in her arms, safe and sound in her house. These rehearsals are in addition to any standing rehearsals. Download the Nutcracker 2011 Rehearsal & Show Schedule. Unless otherwise noted, all the following rehearsals and events are at DWT. 5:30 PM 9:00 PM Tech Rehearsal (Cast 1). As many dancers in costume as possible.